In this exclusive, we traveled to Vegreville to a ceremony celebrating the Pysanka’s 40th Anniversary, and a special street dedication to the Right Honourable Don Mazankowski. The town of Vegreville took this opportunity to make the entire weekend a festival known as vEGGfest. There was a long concert line-up leading to this official event with a ceremony. The ceremony was attended by dignitaries including former premier Ed Stelmach, who is also from the region. 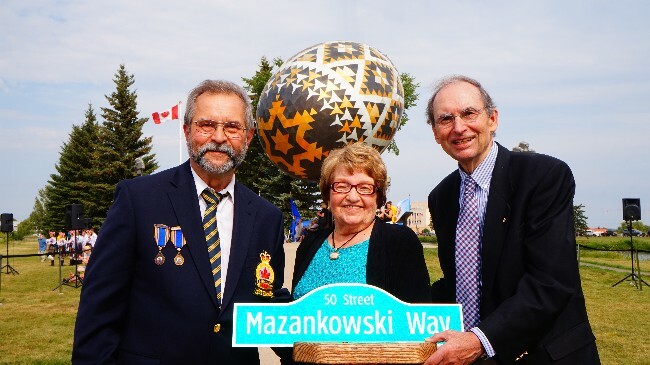 During this time, they celebrated the 40th anniversary of the world’s largest Pysanka, a Ukrainian Easter Egg, and officially dedicated Mazankowski Way, a former Deputy Prime Minister of Canada. The celebration also included Ukrainian dancing, food trucks, folk performances, and a dunk tank to raise money to rehabilitate the Pysanka, which has lasted twice its life span. Watch the video for scenes from the weekend including the dedication of Mazankowski Way by Vegreville Myron Hayduk and an interview with the deputy mayor Michael Simpson. This is a Yegventures exclusive, as there were no other media present for this momentous occasion.